Get the Wireless Party Started! Look, as much as I like (even love) my iPad, it isn’t perfect. One of the biggest flaws has to be the built-in speakers. We’ve come a long way from that mono atrocity the first iPad was cursed with, but even the latest quad-speaker iPad Pro still sounds “just OK” but not something you want to play music on for guests. I’m not blaming Apple in any way though. At the moment there is just no way to get good, full-range sound out of speakers that are small enough to fit inside a razor-thin iPad Air. Luckily there are now literally hundreds of dedicated portable speakers with a surprising amount of clarity and power to offer. While you could go with a generally cheaper wired speaker I think that in this day and age we need to get with the times and make use of wireless Bluetooth. I feel the same way about headphones too, and you can go read my review page on those if you want a more personal audio experience. Wireless is just so much more versatile and convenient. Modern Bluetooth is also now so power efficient that it really has no impact on the battery life of either the speaker or the iPad itself, so why sit with the ball and chain of a wired connection? So let us find something to pump up those jams. I’ve put the speakers I think are the best at the top and sort of left the rest below them without putting them in any order. It’s been a while since I have personally seen anything from Cambridge Soundworks. The company has changed hands several times over the last few years and really isn’t the same one we knew mostly as a maker of pretty good PC speakers back in the day. This is why I was fairly surprised to learn that this OontZ is one of the best-selling Bluetooth speakers on the online market today. The design of the OontZ is one we’ve seen with quite a few speakers like this before. The triangle design makes sense since it provides a good stable foot and plenty of surface area for the speakers. Cambridge has done the right thing here and has a separate subwoofer and two drivers dedicated to mids and highs. This frequency separation is audio 101 if you want clear and powerful sound. It’s the same reason that the quad-speaker iPad Pro plays bass and mid-highs through separate pairs of speakers. The speaker is powerful enough to give decent audio for a living room or kitchen – background music while you and the gang hang out. Or the beach, as it turns out. 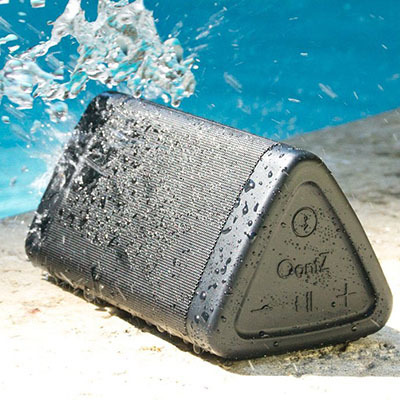 This speaker is also IPX5 water resistant. Which also means it’s not an issue in the shower, and is sandproof and dustproof. The internal battery will give you seven hours of playback, which is more than enough for most people. You can also still use it as a wired speaker too, since there is an included AUX-in connection. Owners of this speaker seem very happy with the sound quality indeed, especially in terms of the bass response. So it seems this proprietary speaker has paid off in spades. The fact that this is also basically a take-anywhere speaker makes it very compelling. I can understand why it is a #1 seller. Well, here is really something a little different; actually a lot different. This is not just a speaker, but more of an intelligent agent in speaker form. Think Siri or Cortana or whatever it is Android phones use. In this case you’ll be speaking to Amazon’s Alexa agent. It connects to the WiFi and lets you tap the mike button to ask all sorts of stuff. It works for tasks such as playing music from various streaming services, getting weather reports, and even ordering stuff like fast food. It’s all very Jetsons and I like that sort of thing. Of course, I wouldn’t even be looking at it if it didn’t also stream the audio from your iPad, which it does, no sweat. The other really neat and unique thing about it is that it plays sound in a 360-degree direction, making it great for playing music in the background. This is achieved by using dual-stereo Dolby speakers. The Tap will play for nine hours and comes with a handy charging cradle. Now, the main downside is that this is not really meant to leave the house. The portability is more a way to move it from room to room, but if it isn’t near WiFi you may as well have any of a number of other speakers. Amazon markets it as being portable but, really, BT speakers are so cheap I’d rather leave this rather expensive one at home. Still, this is one of the coolest gadgets that I have seen in quite some time. If the geekiness of it all appeals to you and the pricetag is OK, then this is an interesting and competent product. The Orange Bolt’s product description reads like a 90s video game ad. It basically boils down to “better, faster, and stronger.” It’s definitely an impressive set of claims, and if you are prone to the outdoor life this is a product that would probably grab your eye. The design is straight up out of the future. This speaker looks too cool for school – literally, if you take this to school they will confiscate it. If however, you are going to take your iPad out in the wild with you (presumably with the appropriate case) then this is the likely companion we want. Why this and not the OontZ? Of course, the OontZ is a fine speaker and ruggedized for use at the beach or on a day out, but the Orange Bolt is more than just a speaker. It also doubles as a flashlight with 120 hours of light, and a power bank so you can charge up your devices. Of course, the big battery is shared across all three functions so you don’t get separate run times for music playback, the flashlight, or the speaker itself. Thanks to that humongous battery, though, you’ll get 30 hours of music playback if the speaker bit is all you need. On top of this it is IPX4 waterproof, which means it can be splashed but not subjected to immersion or strong jets of water. It’s also dustproof and ruggedized against falls. I have to say that Orange Bolt has really thought through the feature set of the Infinite X. Given how much it is supposed to do, the asking price of about $70 is very reasonable and this should easily find a place in your camping or hiking gear. But wait, what about the sound quality? Well, opinions are very mixed. Some people are perfectly happy with the two 3W speakers. Others expected way more sound from a speaker this size, but of course it’s not all speaker; there’s other stuff in there as well. My advice is that if you want the loudest speaker out there than this is not it, but if you want a versatile companion product for your iPad or iPhone out in the wilderness then this is a great place to start. This is another very cheap speaker and so immediately I start to temper my expectations. The product claims to have amazing sound quality. It claims it so strongly that I’m skeptical just from reading about it. The design, on the other hand, presses all the right buttons for me. Simple, elegant, and stylish. It definitely looks more expensive than it is. It also has a cool-looking LED ring, which you’d think would be tacky, but it works somehow. The claim of improved bass seems a little weird considering that there is only one speaker in there as far as I can tell. A little 3W number that is paired to an internal mike, so you can make calls on it too. The battery life is a paltry 2.5 hours, which does not bode well. Still it is very small and if you have a powerbank in your bag you can always top it up via USB. People seem to be impressed with the sound, so perhaps my skepticism is unfounded. All in all, this sounds like a really good choice for twenty bucks, which is the most you could lose on the deal and hey, you can always get a refund. If the crowd truly is wise then this seems like a good choice. I’ve really come to respect the Anker brand. They have been steadfastly mid-range in almost every product category I have seen them in; providing us with stuff that is “not junk” at a price that is reasonable to most people who are not trust-fund babies. Anker gives us a sub-$100 speaker that has quite a bit of thought put into it. Two drivers provide 6W of mid-high frequency while a dedicated subwoofer provides the rumbles. It also has an outstanding 24-hour battery life, so Anker went all-out on the battery itself. The Anker looks pretty good and comes in black, blue, and red. It has big chunky controls and a simple interface, which is a sign of good design. Thanks to the simple layout, pairing is easy. Anker stuff all comes with an 18-month warranty and, thanks to BT 4.0, you can get a range of up to 66 feet. Luckily there is also an AUX IN that uses 3.5mm jacks, so even non-BT stuff is compatible. Users commend the flat, neutral sound of the speaker, which is a good thing. The main criticism comes from the bass. Although there is a dedicated subwoofer, it just doesn’t seem to be up to the task. Unfortunately, if you must have excellent bass you’ll have to start looking up to products like the Bose. 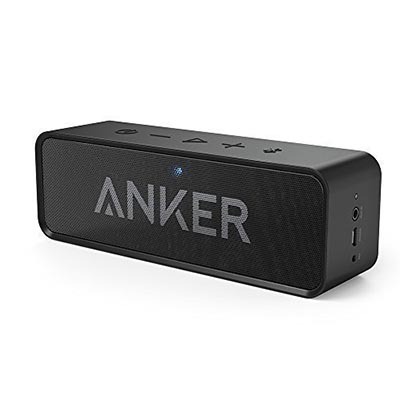 Other than that this Anker speaker comes highly recommended. Oh Bose, you are the darling of the average person who likes good sound, and you are also the favorite punching bag of audiophiles who spend way too much time obsessing about cable gauges. I have always found Bose’s stuff to be great to my non-professional ear and definitely better in a clear way when compared to other products of a similar price. 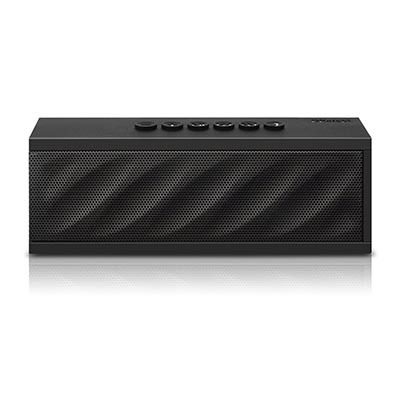 This SoundLink Mini Bluetooth Speaker is one of the most expensive that I looked at, but right from the start I could tell that it wasn’t going to disappoint me. First of all, you may find that the pictures fool you as to the size of the speaker. Look for a picture of a human being holding the device and you’ll notice that it really is quite small. The Bose looks the part of expensive audio equipment and comes in either a carbon or pearl finish. As usual my vote goes with carbon, but it is nice to have the choice. This is Bose, so if you want bright primary colors and pastels you’d better look elsewhere or paint it yourself. 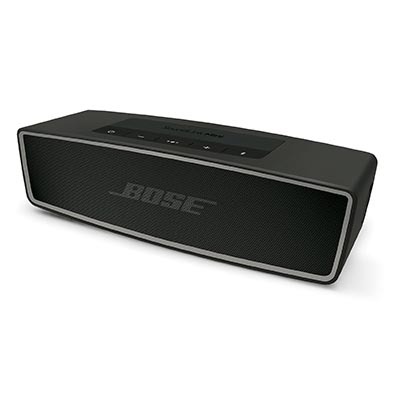 The main selling point of any Bose product is the sound quality, and in the case of the SoundLink Mini it’s (ironically) go big or go home in this department. According to people who have bought it, the bass response is peerless when compared to other Bluetooth speakers, bested only by speaker systems with a separate dedicated subwoofer. The full range of audio is represented with crisp, full, and clear sound. The other thing that really stands out is the battery life. At 10 hours you’d be hard pressed to find something with this much punch that could best it. I know this is a pricey choice, but if you want “dat bass” you need to pay “dat cash”. I wonder if “DKnight” is a play on “Dark Knight” as in Batman? The design of the MagicBox II certainly would not look out of place in Christopher Nolan’s take on Batman. It’s all black, square, and mesh. Very rock and roll, if you like. Of course, you can also get it in brighter colors like red and blue, but that will spoil my theory. The pictures of the MagicBox are actually a bit misleading and make it look bigger than it actually is. When you see it held in a hand it becomes clear that this is actually a very small unit at only six inches long. Not the smallest, mind you – the OontZ is an inch smaller. The MagicBox has 10W of power, which is frankly a lot for something this small. Even better, the battery can power it for 10 hours of playback. It is not, however, water resistant and costs more than the OontZ, so you really should only buy it if the extra volume and longer playtime is absolutely needed. Singing in the shower is one of those things that just about everyone does, but no one will admit to. 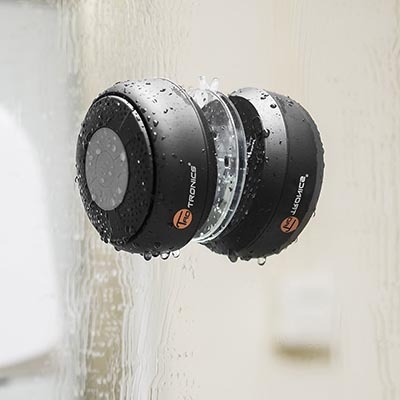 If you’re going to do it you may as well make use of those karaoke album versions on Apple music and use a shower speaker like this one to belt out properly. Alternatively you can be all boring and listen to the news or some podcasts instead. Whatever floats your boat, boring person. The real question is that, if you insist on having a speaker in the shower, is this TaoTronic unit the right one? Honestly, the other TaoTronic stuff I’ve seen didn’t leave me impressed and this speaker is dirt cheap. 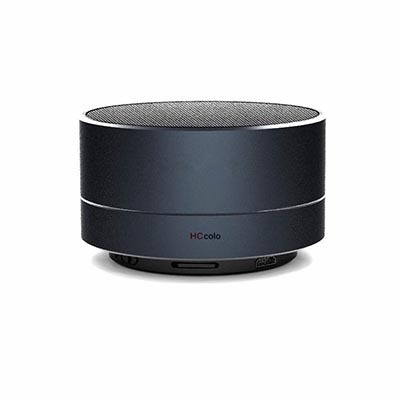 It has a suction cup, which will keep it affixed to the tiles and playback controls as expected – meaning your phone or tablet can be in the next room. The waterproof rating is only IPX4, which means it’s splash resistant but it won’t hold up to a strong jet of water or any sort of immersion at all. The sound is OK, according to buyers, but you should just use it in the shower, as it doesn’t even compare with a non-shower speaker. In fact, buy the OontZ instead; it can also work in the shower and has a higher IP rating. 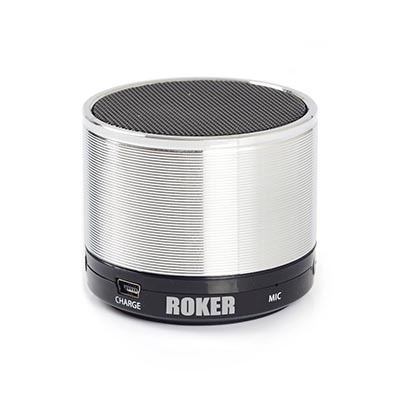 Roker isn’t a brand I’ve heard of personally, but right off the bat I quite like the design of this little cheapo speaker. It’s got this sort of screw-thread finish that is unlike anything else I’ve seen. So if you like a bit of novelty this can start at least a short little conversation when you take it out. The S-Cannon is still a very low-price item and it shows in the specs. It only supports Bluetooth 3.0 for one thing, which means many of the new battery-saving features on both ends of the radio transmission will be missing. Other than Bluetooth, you can also hook up a plain old 3.5mm jack or play music from TF (aka microSD) cards. 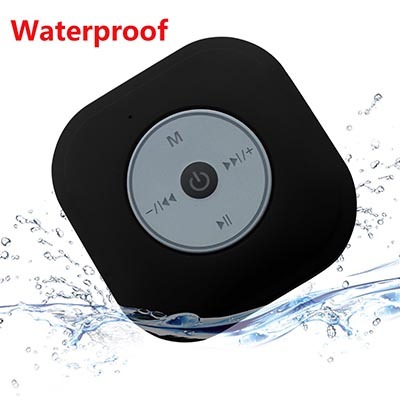 I don’t know who you are marketing your product to when you have a picture of it actually falling into water. Clumsy people? Mermaids? 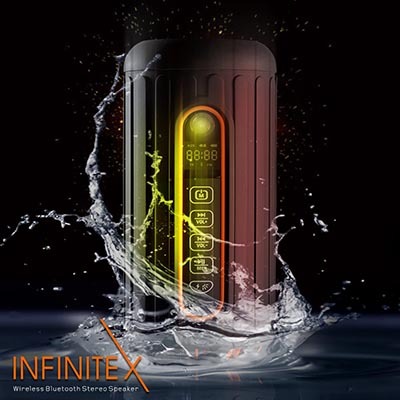 In any case, the last thing you want to do with the NUTK is to drop it in water as it is only “waterproof” up to IPX4 standard, which means splash only. Not immersion. Not a strong stream of water. Just some splashing. Way to falsely advertise, guys. So, OK, we are off on a bad foot. Let’s see if there is anything to redeem the product past the “waterproof” stuff. It has a detachable suction cup, which means that it’s actually one of those shower speakers, but they also show it stuck to the inside of a car windscreen, which makes zero sense since I’m pretty sure they don’t even make cars without stereos in them anymore. The shape of the speaker is actually pretty attractive, but the control face looks like a first-gen iPod which these days is just ugly, if I have to be honest. I can’t find too many impressions of the sound on this little guy and those who have given their view were given free products, so take that as you will. For what it is worth, they say that the sound is “OK”. Not the amazing, overhyped “Hi-Def Studio” sound the NUTK promises. That’s it for these popular speaker choices. I think there are really some great choices at every price point on the market today. 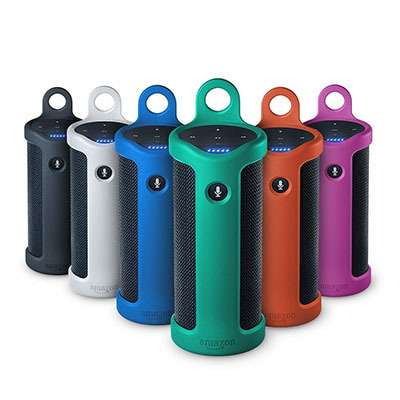 Of course, you may not have found what you are looking for here, so be sure to check out my Bluetooth speaker buyer’s guide for a better idea of what to look for when out hunting for your next party starter.